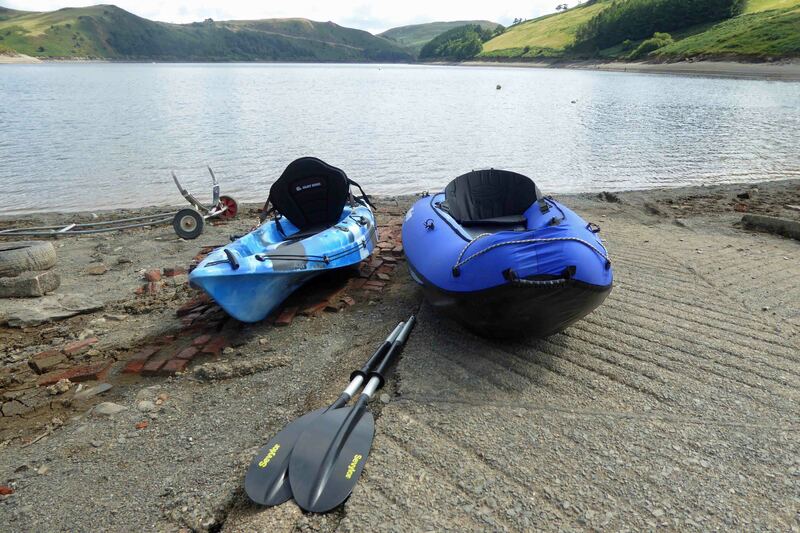 On a Sunday Morning in early August in 2018, we were spending a few days camping at Llyn Clywedog near Llanidloes with sailing friends although we had chosen to bring a couple of kayaks rather than a boat. The lake was once a fertile valley before the dam was built to harness a water supply in the 1960s. During something of a restless night, I got up at 4.45am for the short walk to the clubhouse. Across the lake in the half light, the first signs of emerging rays of weak sunlight crept over the distant hills. The water of the lake was jet black and flat calm, not a breath was stirring. I walked down to the water’s edge, far lower than I had seen it before because of the prolonged spell of hot weather. I paddled the inflatable kayak out into the middle of the lake. Slowly, the hint of sunlight grew into a deepening orange sky in the east. At the far bank, that now rises steeply, perhaps twelve metres to its normal mark, several sawn tree stumps had been exposed, together with a single small tree of bare-boned branches strangled when the valley was flooded more than fifty years ago. Remarkably it was still standing upright. I paddled on with no particular destination in mind and soon found myself in a small bay. A line of bleached fenceposts led down the bank and disappeared into the water, the work of a farmer from long ago. It was strange to think that sheep had once grazed in pastures now many fathoms below the water. It led me into a contemplative mood as I half drifted back across the lake watching the sky becoming lighter and listening to the trout rising to the surface. An hour later I was back on shore returning to camp and eventually, back to sleep. It was then rather poignant when later in the morning, I had a phone call to tell me that Malcolm, my eldest brother and family patriarch, had died from an apparent heart attack around the time I was waking up for the second time. Nothing stays the same, things change, often in small, subtle ways, punctured occasionally by more traumatic, events. Farewell brother.